Pluto's moon Charon is covered with crystalline water and ammonia Ice. According to an article published in the 7 January 2000 issue of Science magazine, researchers from the California Institute of Technology and the University of Nevada-Reno claim to have discovered crystalline water and ammonia ice on the surface of Pluto's moon Charon. This would be in agreement with data collected by Voyager surveys which have shown these ices to be components of a large number of similarly sized satellites in the outer solar system. Studies of both Pluto and Charon show that the two worlds currently have markedly different surfaces. While Pluto is thought to be composed of a mixture of rock and ice, Charon is thought to be almost completely composed of various ices. The surface of Pluto is covered with frozen Carbon monoxide and Methane. Charon's is not. Pluto's escape velocity is much higher than Charon's - that is - gases can sublimate over immense periods of time and eventually escape the surface of Charon much more easily than they can from Pluto. Over the age of the solar system the authors suggest that Charon lost these more volatile gases while retaining water and Ammonia. The authors of this paper suggest that underneath Pluto's current covering - one which expands and freezes as Pluto orbits the sun - may be a similar mixture of water and Ammonia found on Charon. In addition to determining the chemical make up of many outer solar system moons, Voyager also showed that small, incredibly cold moons such as Charon could still have a period of active geology - perhaps even ongoing. Such geological processes could be driven by the tidal heating that results from gravitational interactions. The authors note that Charon is very similar in size to two moons circling Uranus - Ariel and Umbriel - both of which demonstrate clear evidence of geological activity at some point in their life histories. Much more vivid examples of the effect of tidal heating can be seen in the Jovian system: Io's volcanos and the possible liquid oceans beneath Europa's icy surface and perhaps within Ganymede and Callisto as well. Pluto has a diameter of 1,413 miles while Charon's is 728 miles. No other planet and its moon are so close in size to one another. Only Earth and its moon come close. 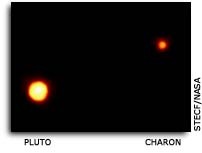 Unlike the Earth/Moon system, Pluto and Charon's rotation are both exactly the same (6.387 days) meaning that they always show the same face to each other. Pluto takes 249 years to complete one orbit of the sun, and, with the exception of several decades when it's elliptical orbit takes it closer to the Sun than Neptune, is the farthest planet from the sun. Pluto's stature as a "planet" has been contested recently given that many astronomers now believe that Pluto is just the largest (known) representative of a large number of objects in the outer solar system.